On October 29, aging advocates closed out another successful annual National Aging and Law Conference (NALC) in Alexandria, Virginia. Unpacking, I sifted through the usual post-conference paper trail tornado: hotel notepads scribbled with ideas, business cards of inspiring advocates, and brochures from innovative legal programs. Reading through these materials, a few words kept popping up-partnership, engagement, coordination, capacity. One thing became very clear: our network of legal and aging professionals work tirelessly to improve the lives of older adults. Yet, there seems to be unanimous recognition that our network needs a clear, unified system to support this work. Justice in Aging is working hard to meet that need. 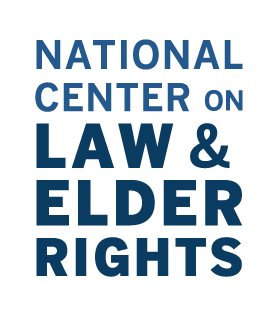 In early 2017, we will launch the new National Center on Law and Elder Rights (NCLER), a resource support center providing a curated package of training and targeted assistance to the legal and aging network. Created through a contract with the Administration on Community Living (ACL), the NCLER will provide legal services and aging and disability community with coordinated tools and resources to help them better serve older adults with the greatest economic and social needs. With our valued partners, the ABA Commission on Law and Aging, the National Consumer Law Center, and the Center for Social Gerontology, we will provide a full range of resource support. During the opening plenary session of NALC, Edwin Walker, Acting Administrator for ACL, introduced ACL’s vision for the NCLER. He pointed out that legal services are always on the front-lines of the most pressing issues impacting older adults, such as housing, health care, and elder abuse. A core component of the Older Americans Act (OAA) is funding and supporting legal services. Each year, ACL, working with the states, funds around 1,000 legal services providers through the OAA to ensure older adults are empowered and can age with dignity. As he introduced the NCLER, Mr. Walker shared that a core goal of the NCLER is to help build the capacity of the dedicated legal services network. Over the next few months, Justice in Aging will be designing and developing the NCLER to meet that goal. Throughout this process, we’re seeking input from the network, to learn more about what’s working well and where help is needed. Throughout the conference, presenters dazzled with impressive innovations; like the Self-Represented Litigation Network, whose creative solutions helps provide legal justice to individuals in remote locations, or the UC Hastings/UCSF Medical-Legal Partnership for Seniors, which is leveraging the University’s health and legal capacity to provide critical, often life-saving, interventions to low-income older adults. Sharing these types of best practices and responding to critical needs is a goal for the NCLER. Through the NCLER, we’ll be able to amplify the solutions and ideas shared at conferences like NALC. Through ACL’s vision and Justice in Aging’s leadership, the NCLER will unify the provision of quality legal resources to enhance our network’s capacity. It’s a big goal, and we look forward to learning from the network as we put it all together. By next year’s conference, the lessons learned and creative models shared at NALC won’t end up as crumpled notes in luggage, but will be incorporated into a centralized, dynamic NCLER, utilized by the network all year round.